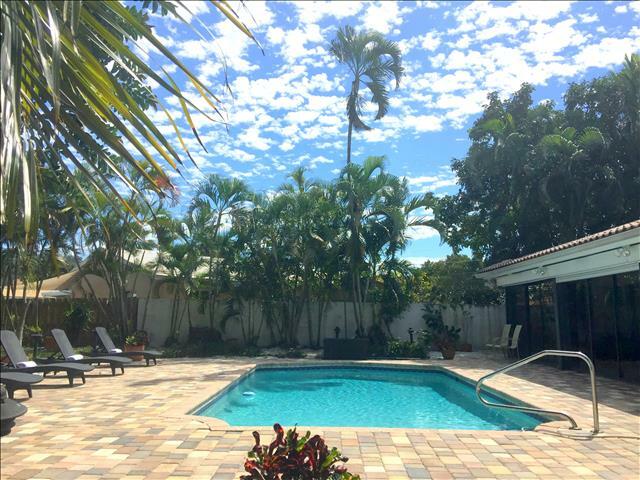 Beautifully situated east of US1 (Federal Hwy) between Commercial and Atlantic Blvd. 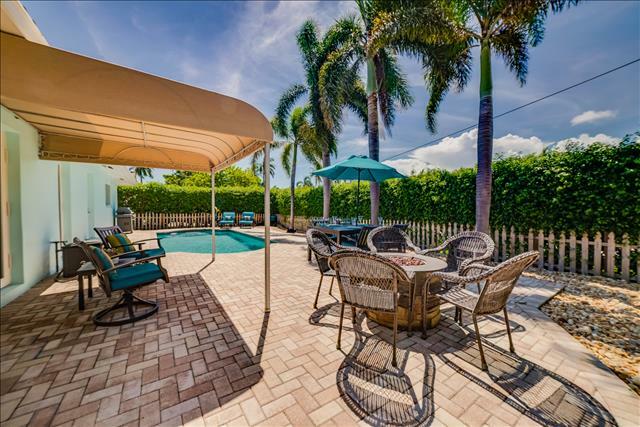 in a lovely residential neighborhood where Ft. Lauderdale and Pompano meet. 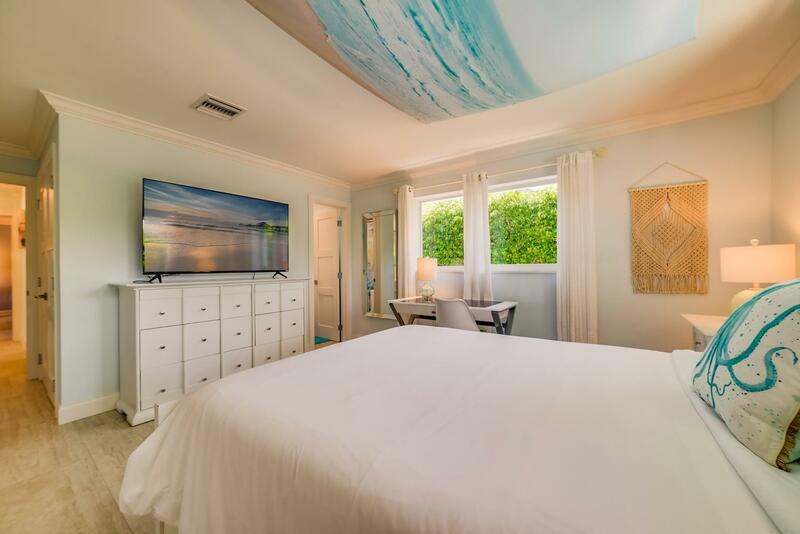 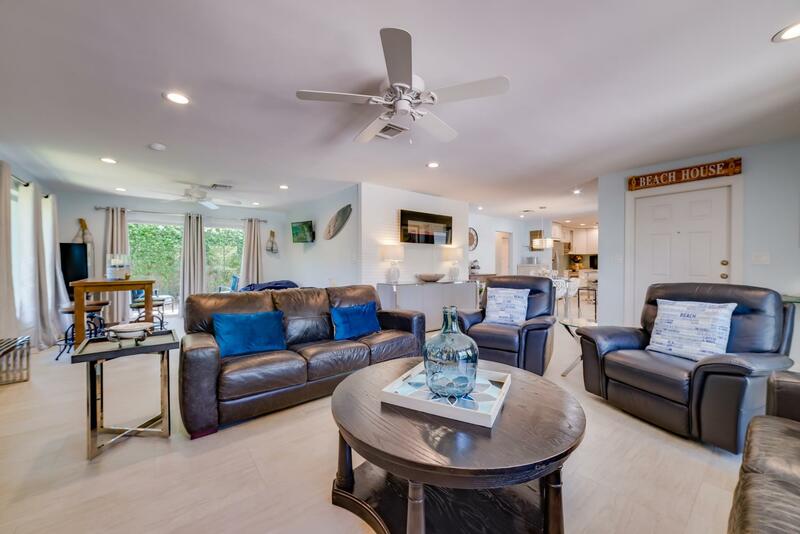 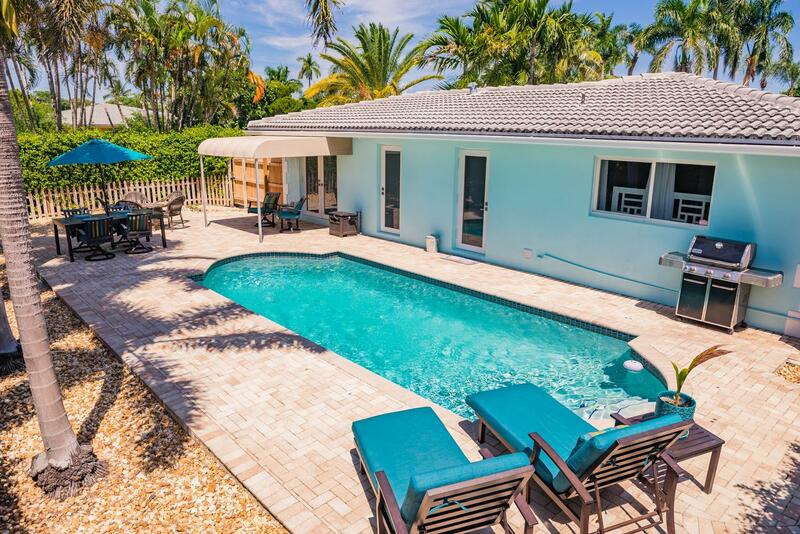 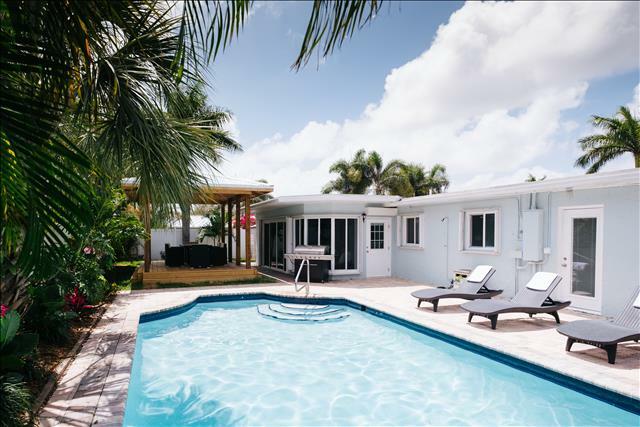 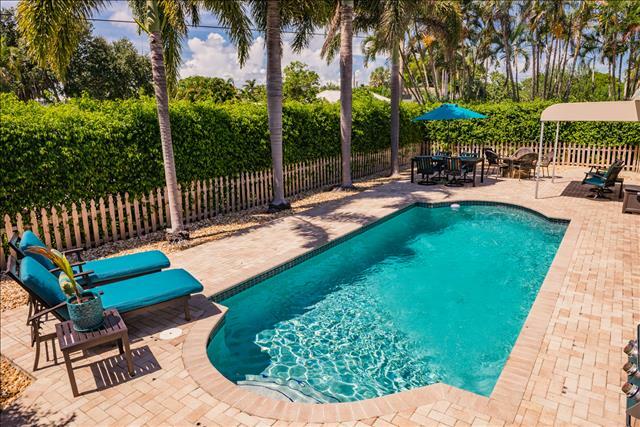 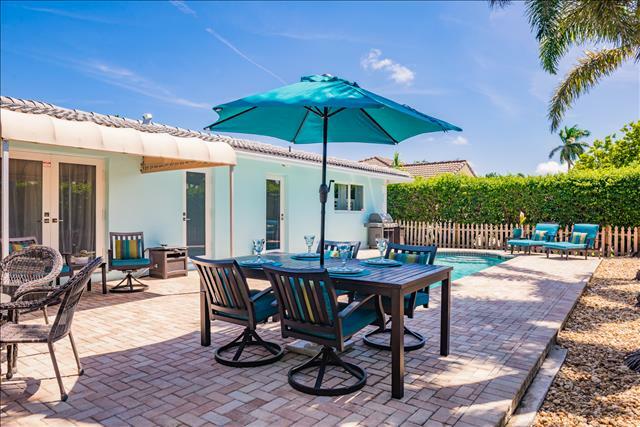 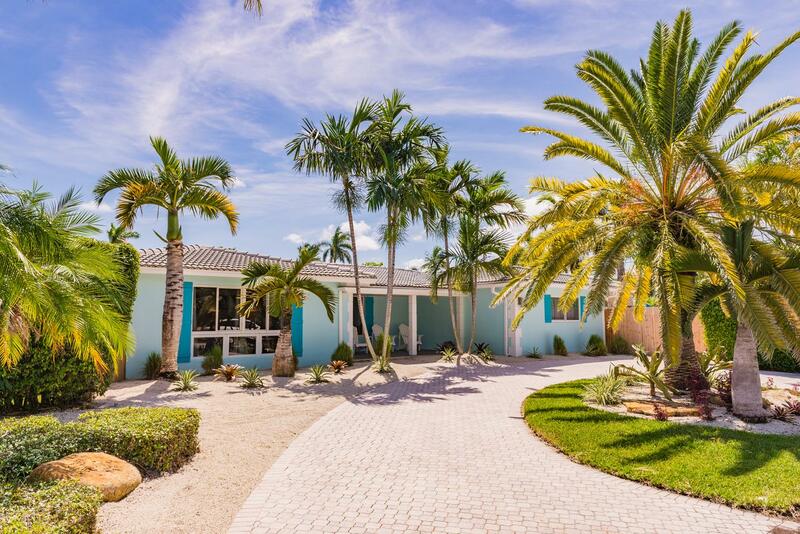 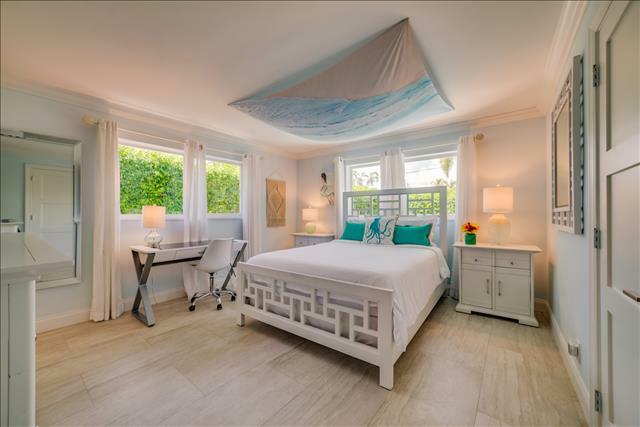 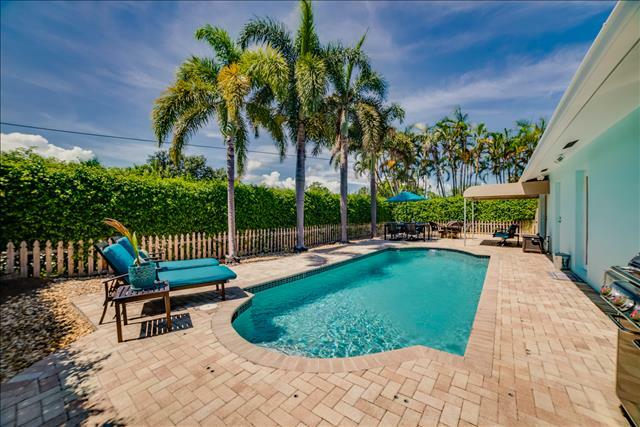 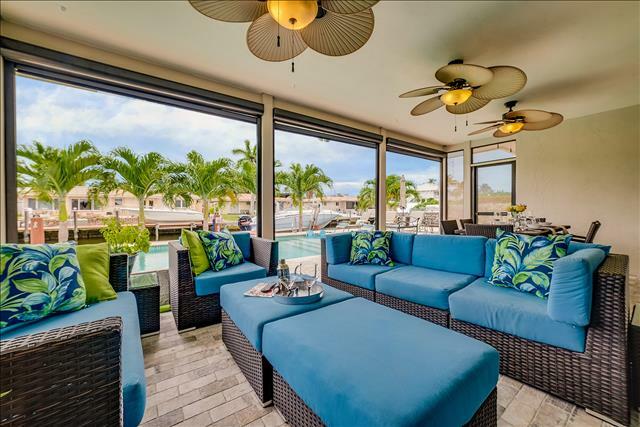 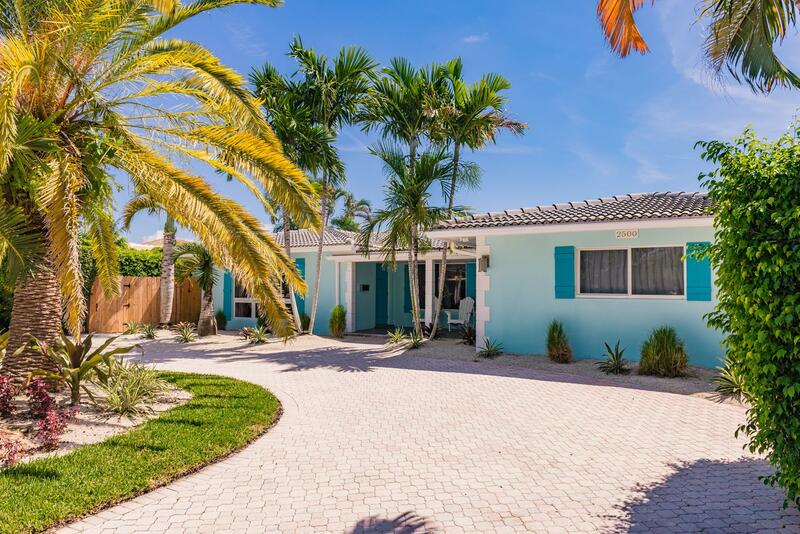 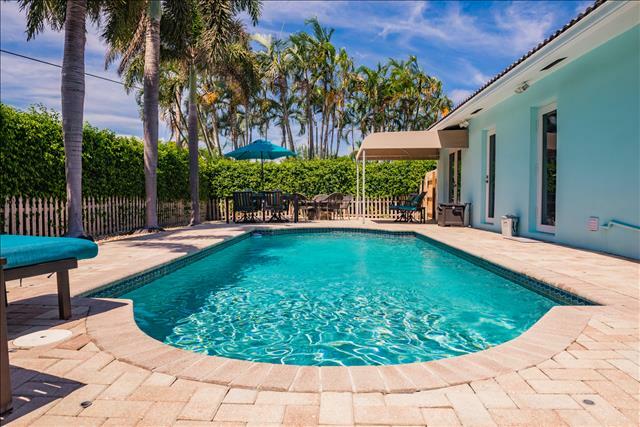 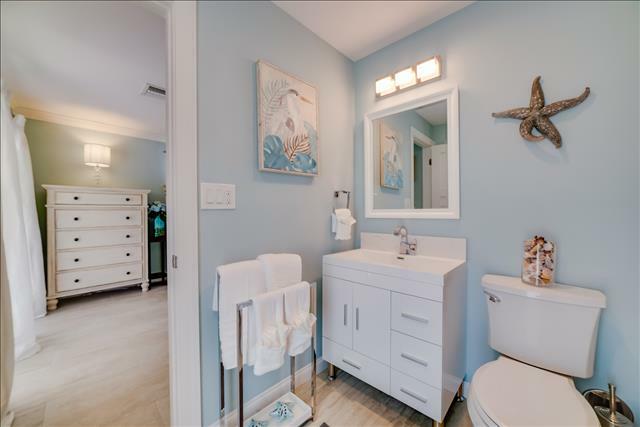 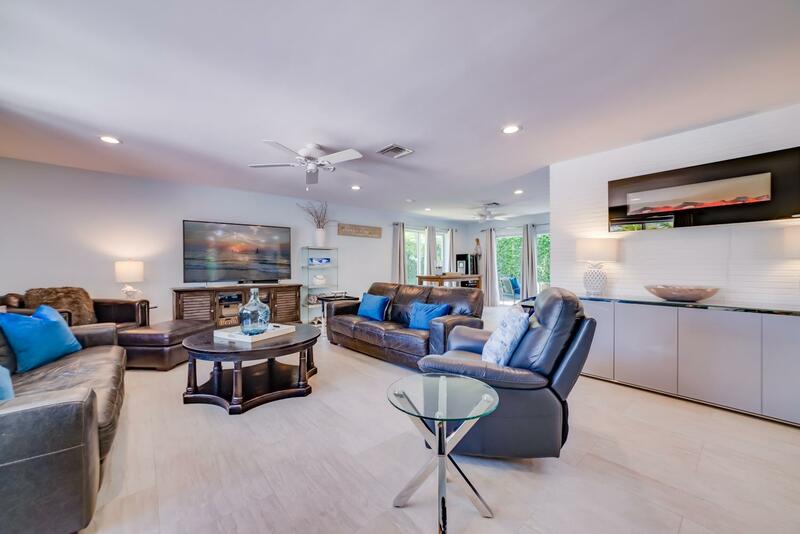 This spectacular 3 Bedroom, 3 Bathroom, Key West style, pool home, offers everything one could possibly expect from a five-star vacation residence. 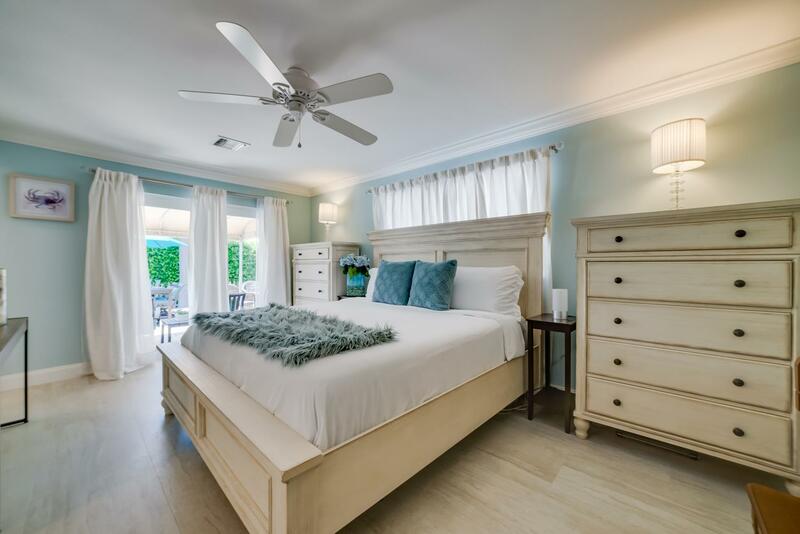 If you are seeking absolute relaxation and comfort look no further. 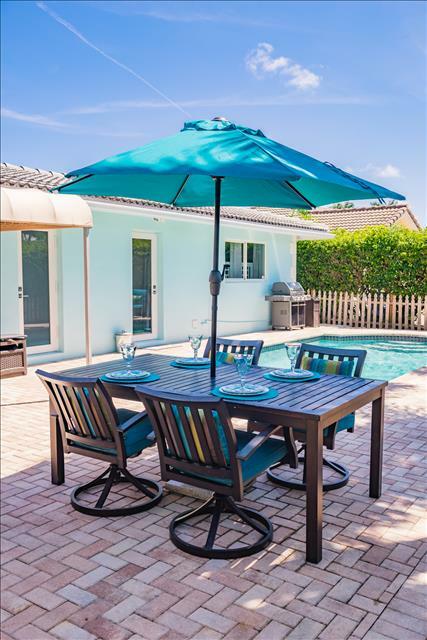 Casa Cordes has been meticulously updated throughout in kitchen, baths and flooring. The blue hues are refreshing and relaxing. 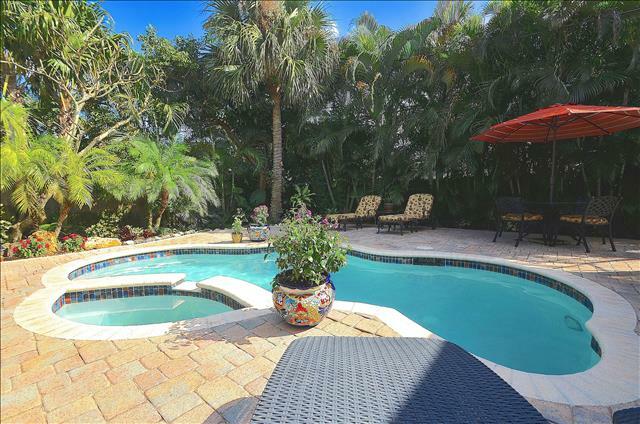 The grounds are meticulously landscaped and offer absolute privacy. 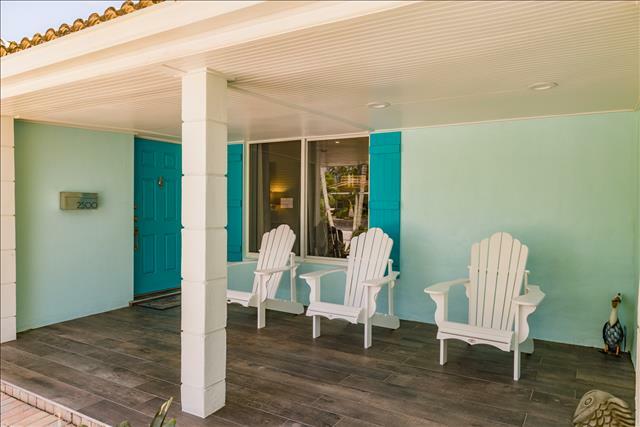 The covered front porch offers adirondack chairs for relaxing with a great book. 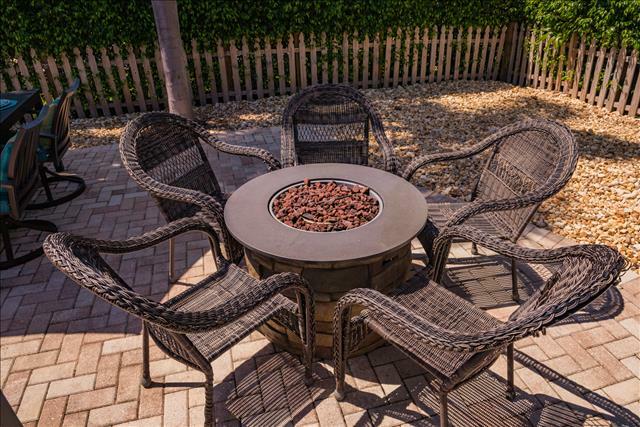 The large circular driveway offers ample parking for at least three (3) automobiles. 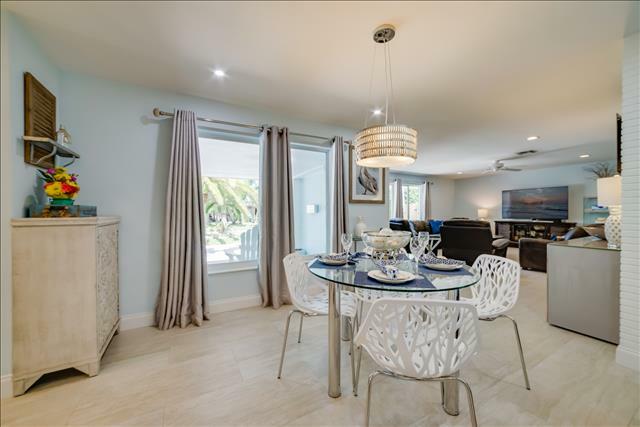 Upon entering Casa Cordes, you will find a very open floor plan with living and dining areas all in view. The main living area of the home is spacious, offers ample seating and is an ideal setting for entertaining both family and guests. 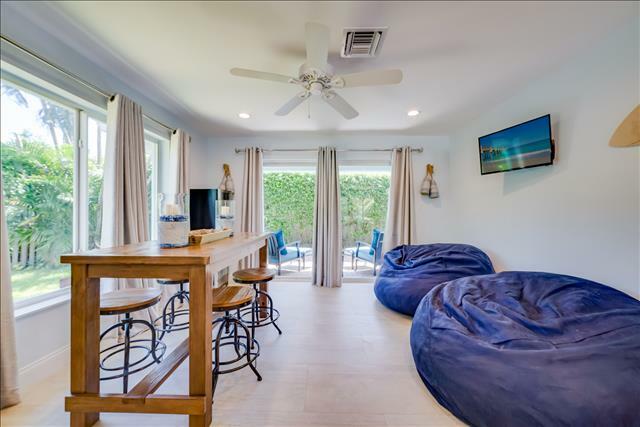 The living area features two full-size leather sofas, as well as three oversized leather chairs, side tables, sofa tables and coffee table. 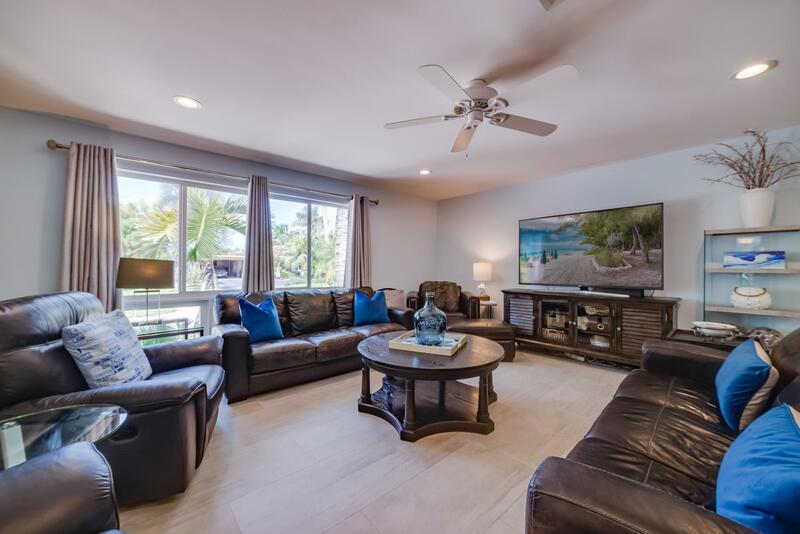 There is an entertainment center equipped with a 60” LED television. 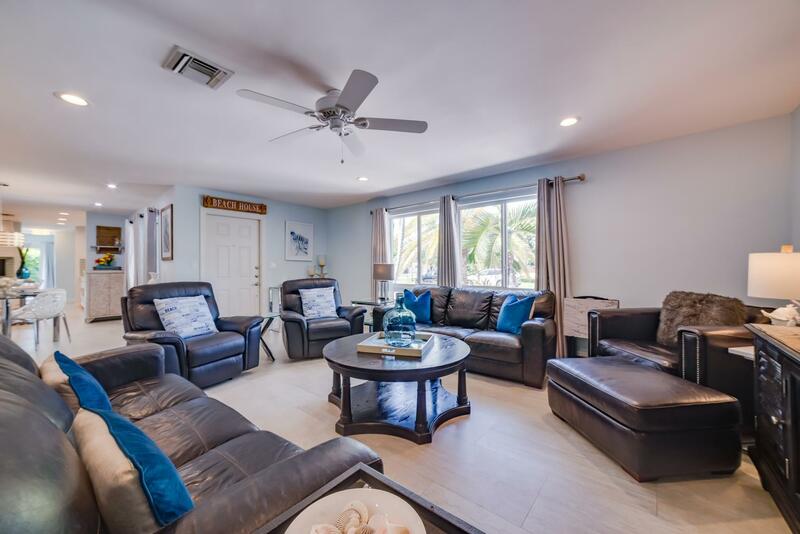 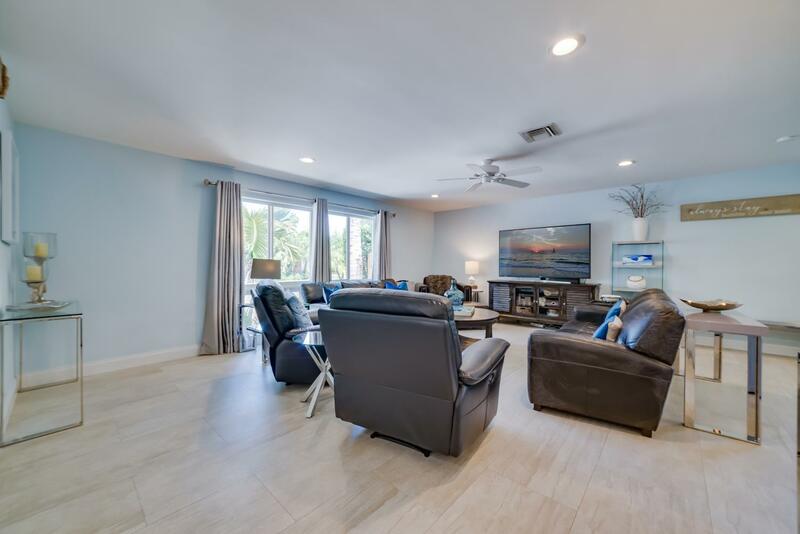 Adjacent to the main living area you will find a Florida room with bar height table, 4 bar stools, flat screen on the wall & and bean bag chairs large enough for adults! 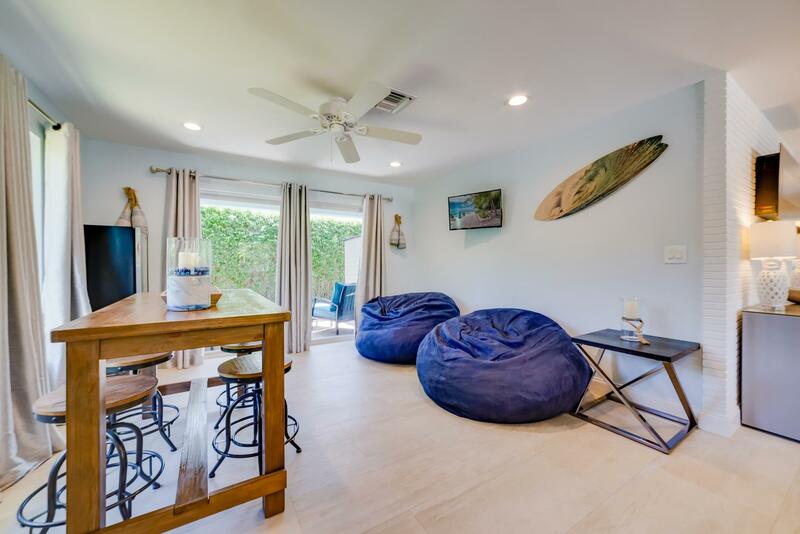 This area is perfect for family board games, card games, gaming or laptop lounging. 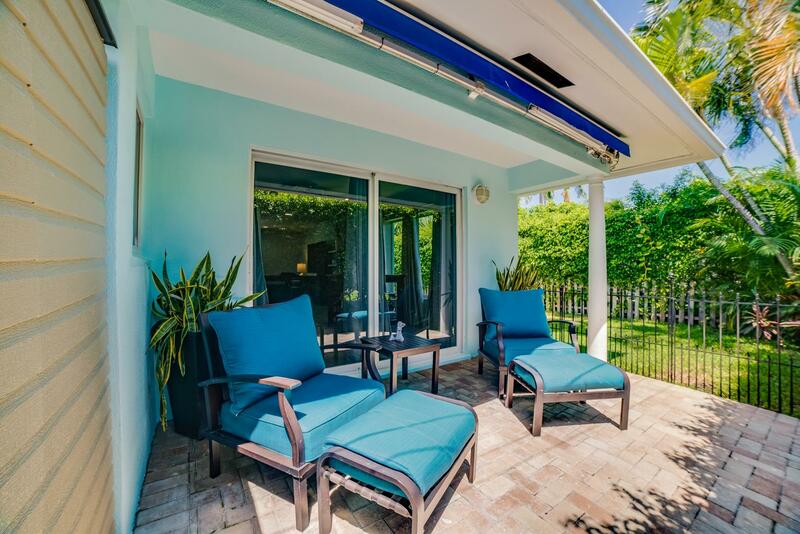 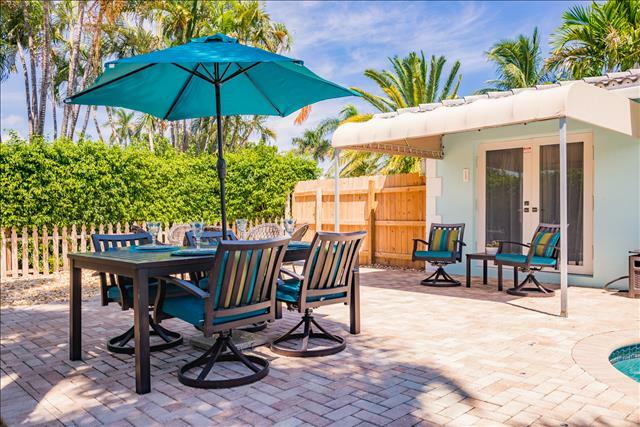 Off the Florida room you will find sliders that lead out to a small covered patio with two outdoor patio chairs. The kitchen is gorgeous and exceptionally open, offering breakfast island counter dining for four (4) and an adjacent dining table thats seats six (6), as the 2 extra chairs not photographed are in the closet. 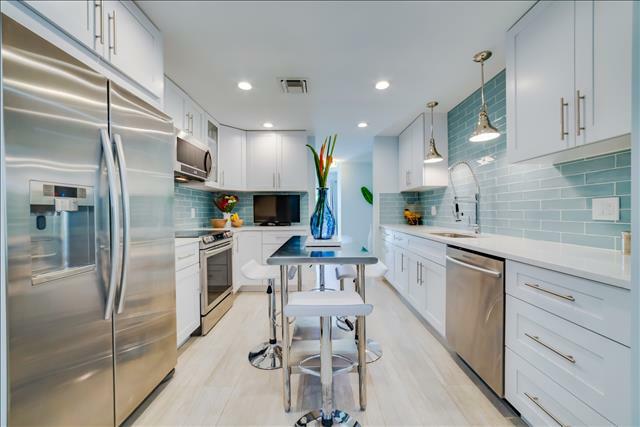 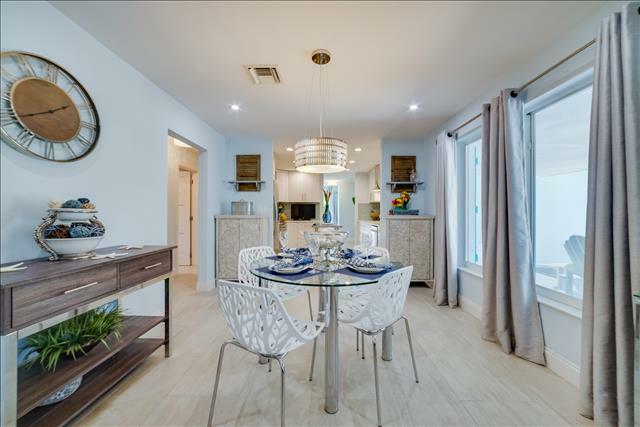 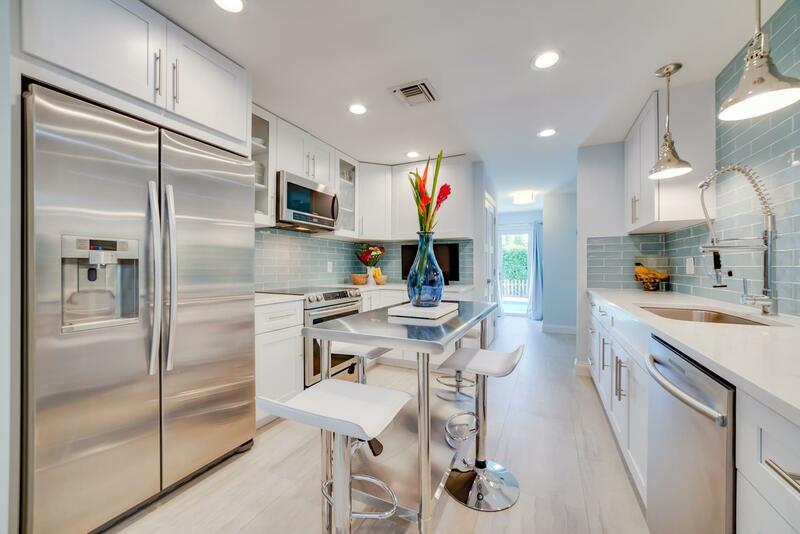 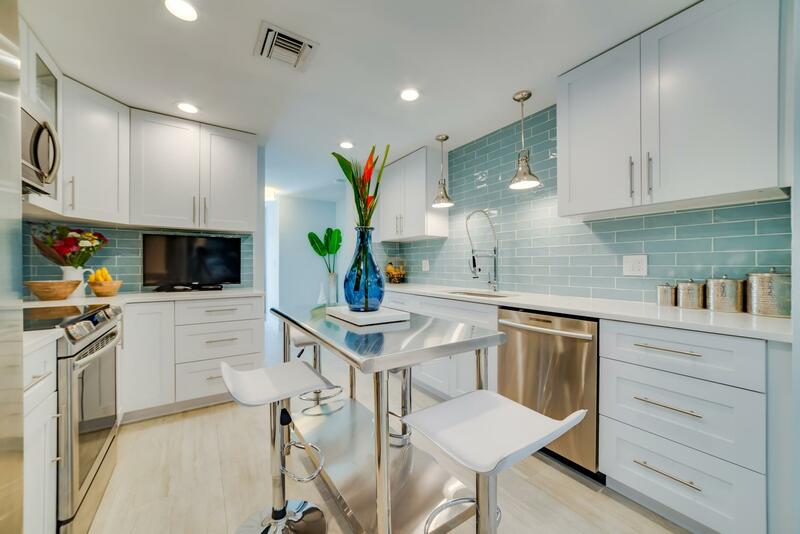 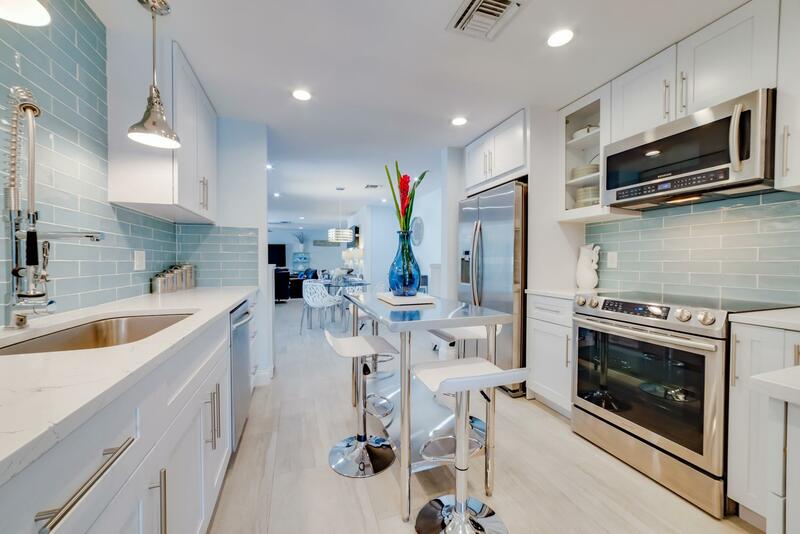 The kitchen is equipped with new white custom wood cabinetry, sage blue modern subway tiles, Corian counters, stainless appliances, and fully equipped and stocked kitchen. 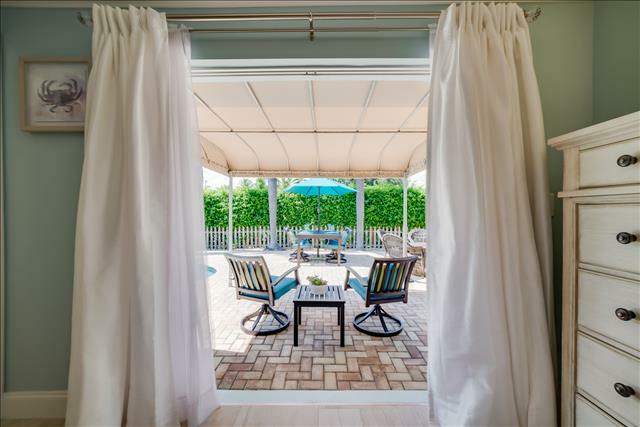 There is a hallway off the kitchen that leads to the outdoor pool area. You may also access the pool from the master bedroom. 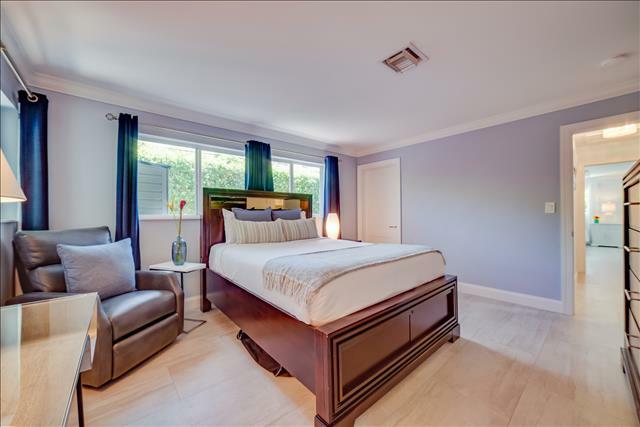 This is a nice split bedroom floor plan with two bedrooms on one side and the master on the opposite side. 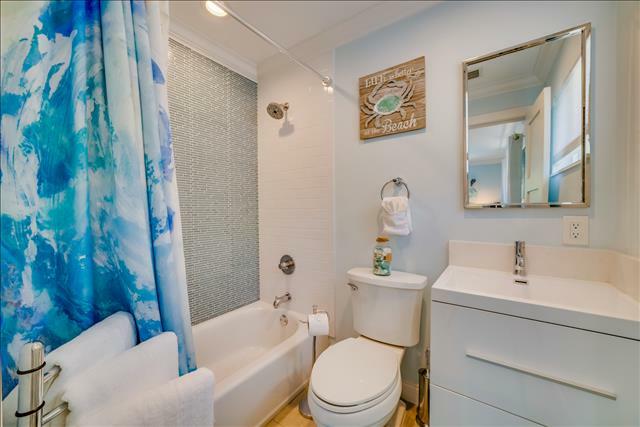 Off of the kitchen you will find a hallway bathroom and Bedrooms two and three. Bedroom Two is equipped with the following: Queen Size Bed, two nightstands, a full-size dresser and desk. For your enjoyment, there is a large LED wall mounted television. Bedroom Two offers a private, en-suite bathroom equipped with a full-size bathtub/shower and a modern vanity sink. 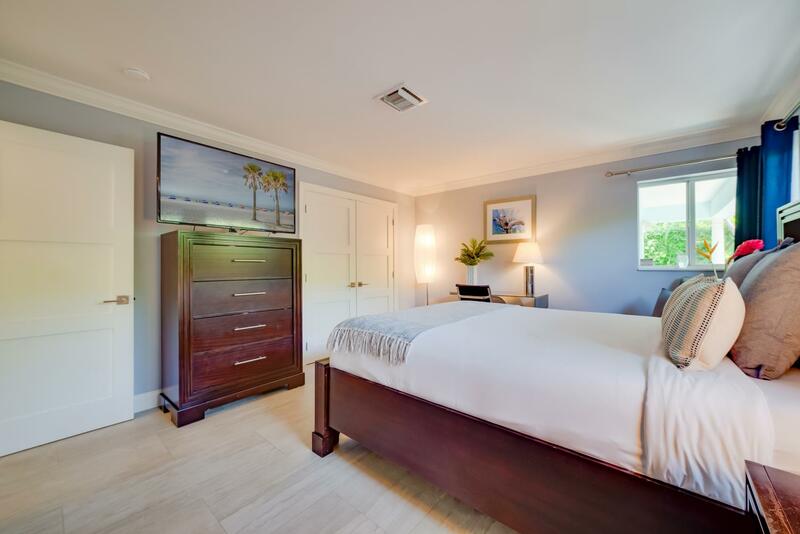 Bedroom Three is equipped with the following: Queen Size Bed, two nightstands, tall dresser, desk, sitting chair and a large LED wall mounted television. 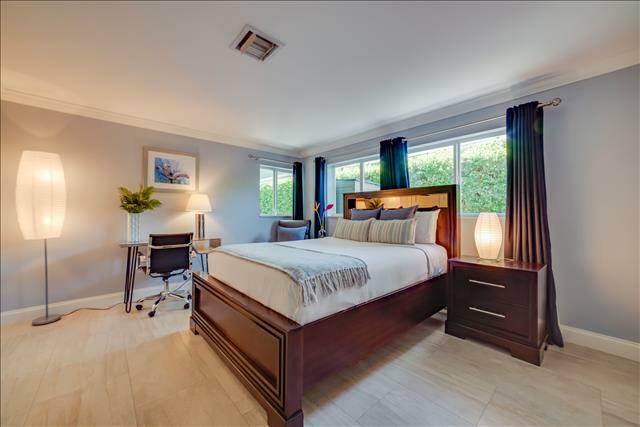 Bedroom Three offers an en-suite bathroom equipped with a custom walk-in shower and a modern vanity sink. 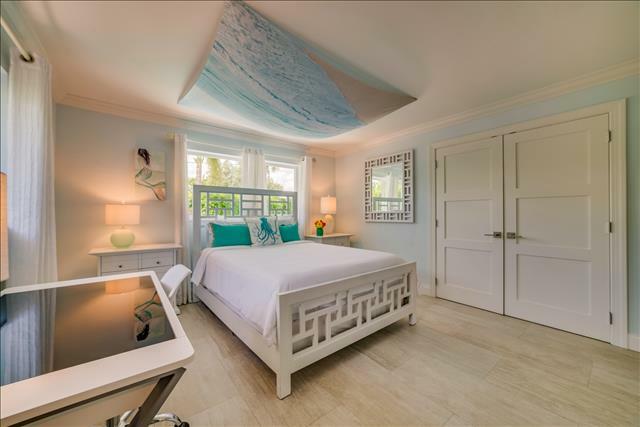 The second half of this spectacular home is comprised of the private and spacious master suite. 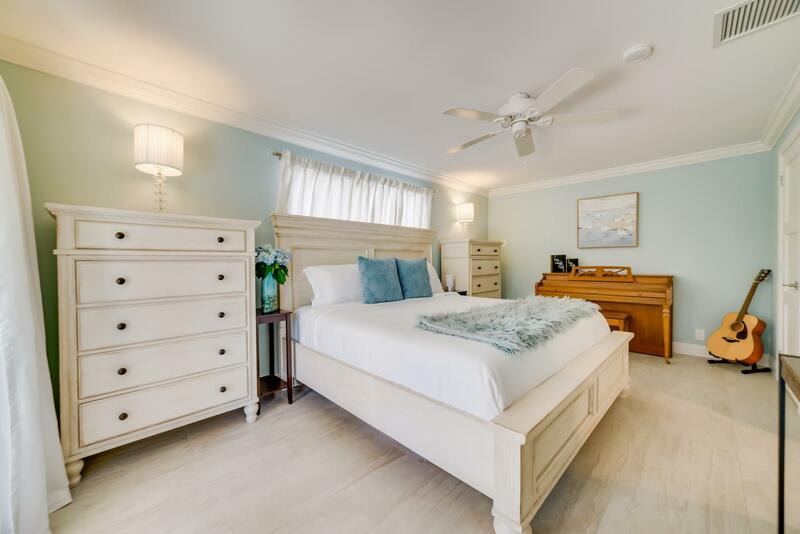 Beautifully furnished and tastefully decorated, the master suite offers the following: King Size Bed, two nightstands, and two full-size tall dressers and a piano! 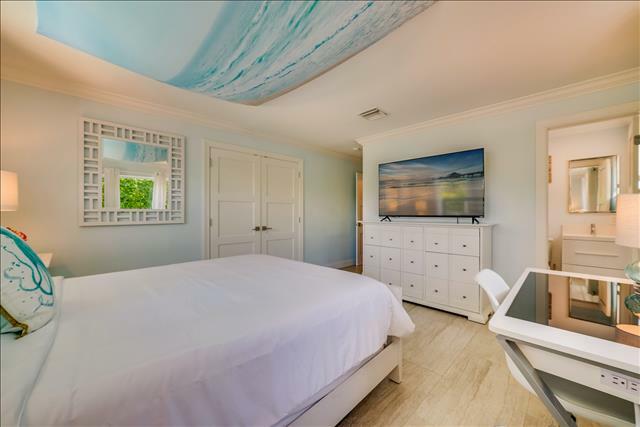 For your enjoyment, there is a large LED wall mounted television. 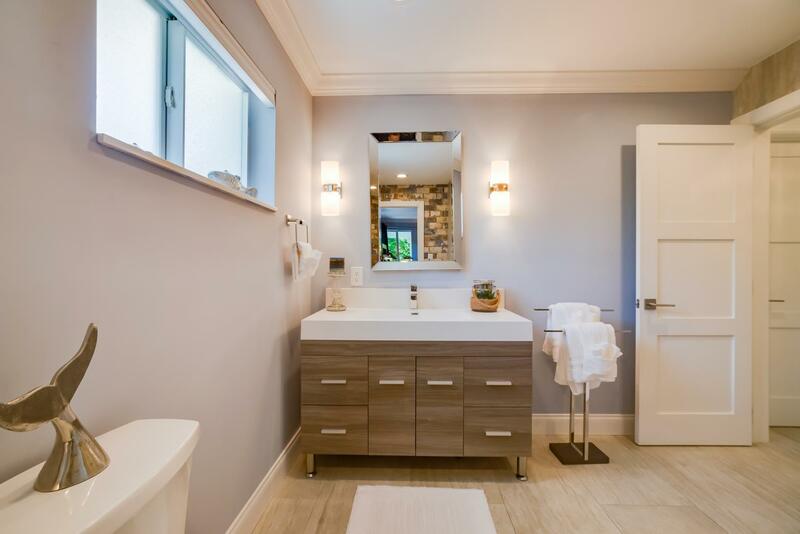 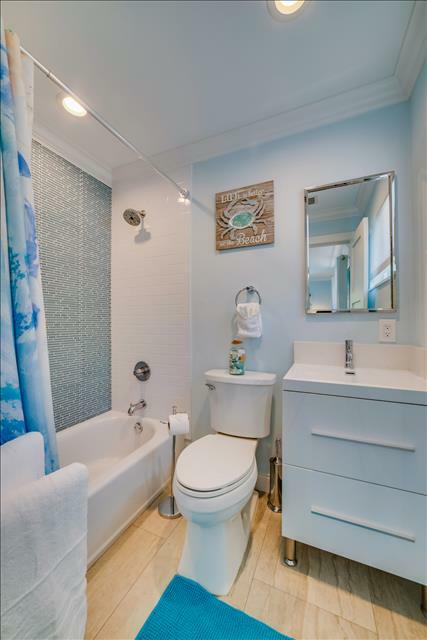 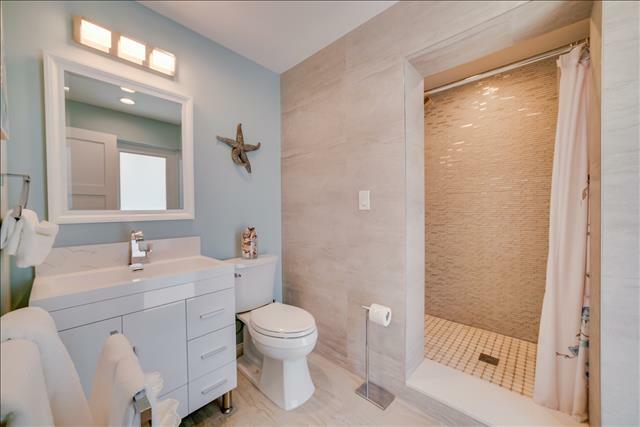 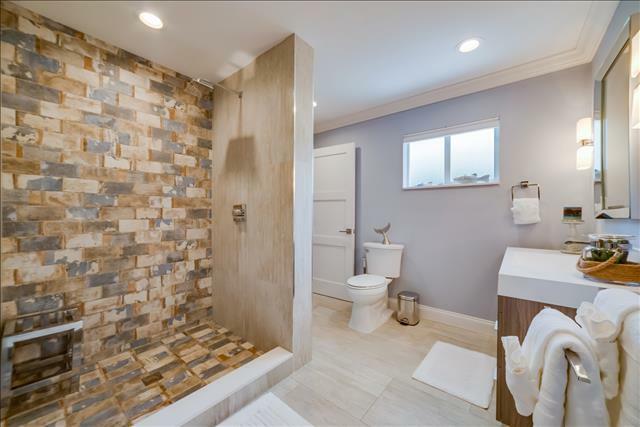 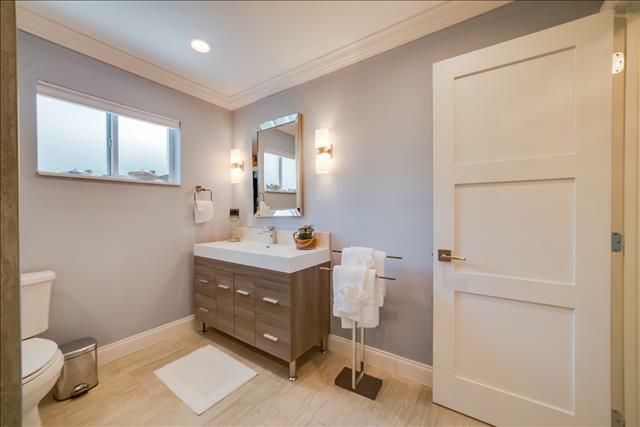 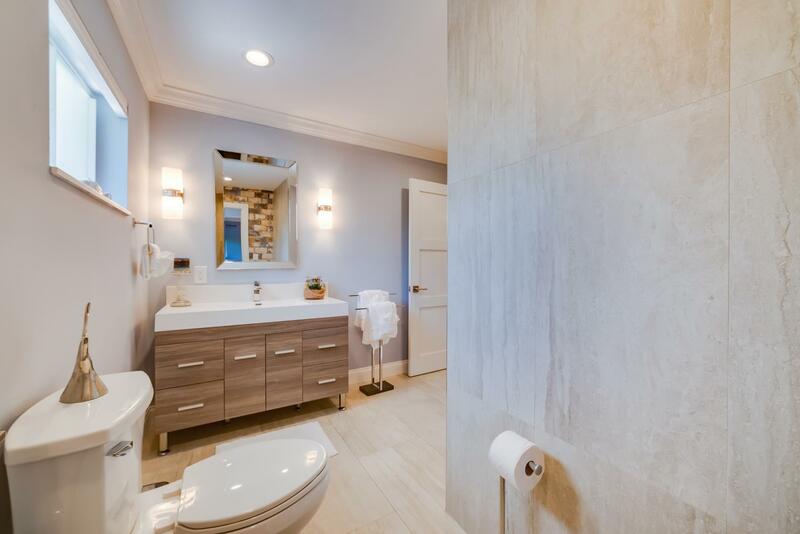 The master bathroom offers a custom walk-in shower and a modern vanity sink. The master bedroom offers a pool view and doors out to the pool. The private outdoor space is equipped with a full size lap pool, chaise lounge pool chairs, patio dining for four, covered seating for two, and a round seating area for five. 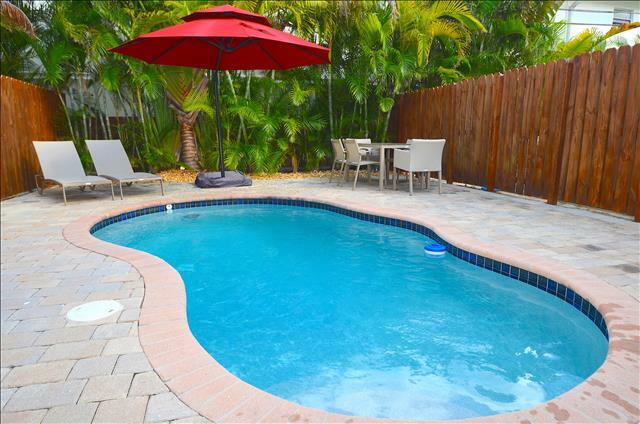 The pool area also features a gas BBQ grill. 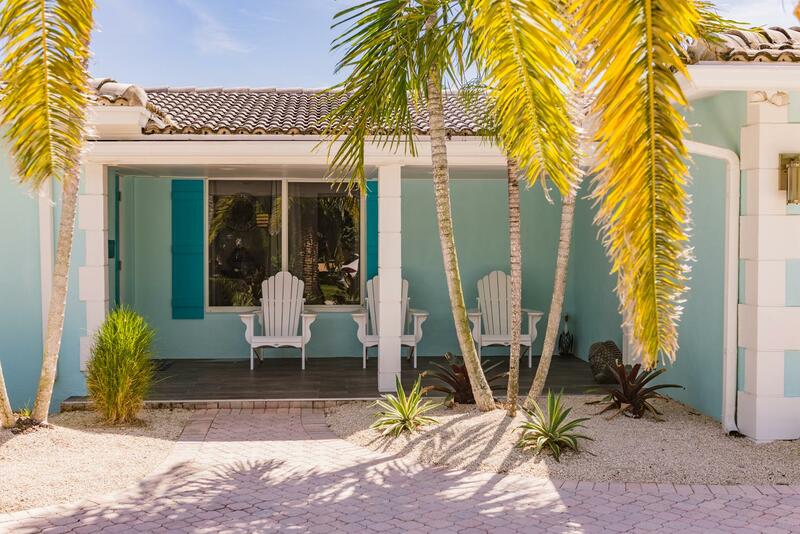 The main beach portal is a short distance away (under 1 mile) and offers plenty of parking, lifeguard towers, outdoor cabanas for daily rental, snack shacks, children's playground, outdoor exercise circuit and volleyball courts, etc. This beach was recently renovated and made the top ten beaches list in Time magazine! There is a brand new ocean front restaurant called “Beach House” with spectacular views and great food! 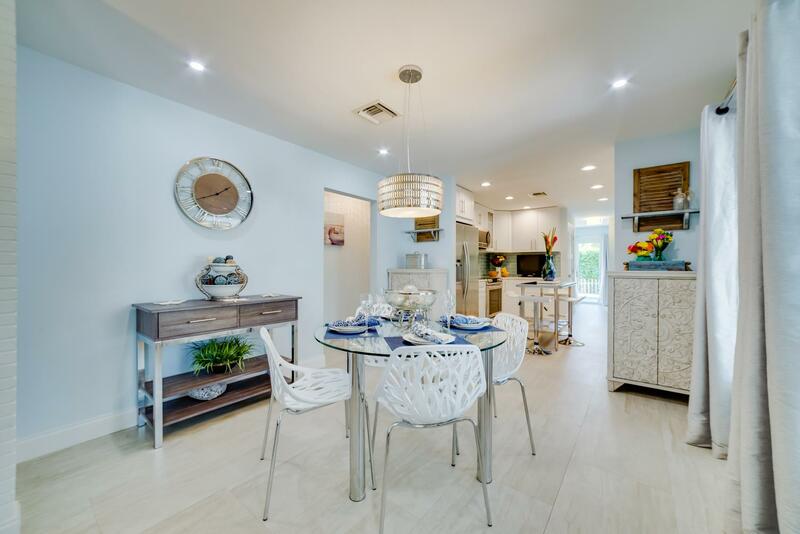 There are also a multitude of first class restaurants in the immediate beach area, as well as a new Publix grocery store. 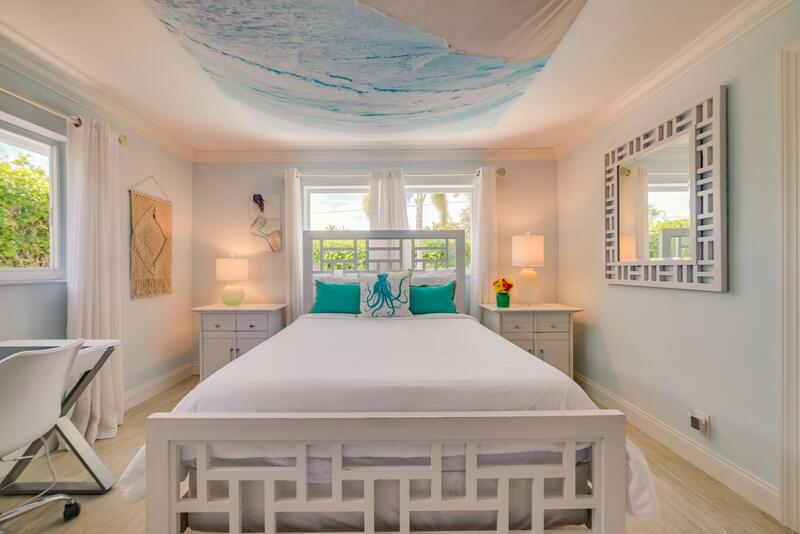 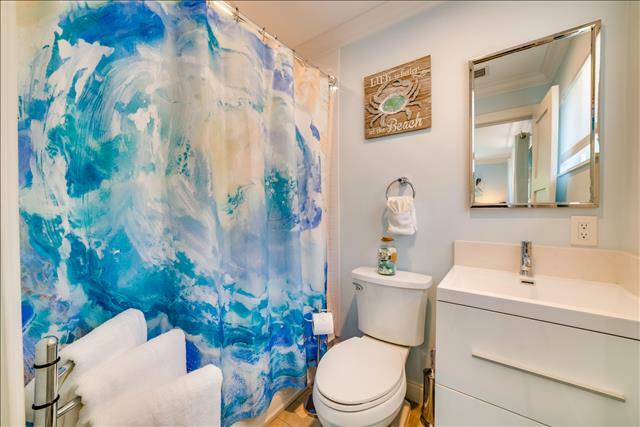 Linens, towels and beach essentials are included. 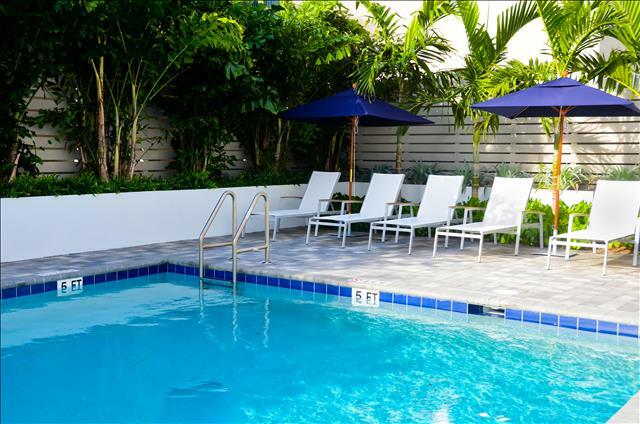 Renter must provide a credit card and driver’s license at check-in. Renter must agree to a $1,000.00 pre-authorized credit card security deposit hold. This is not a charge. 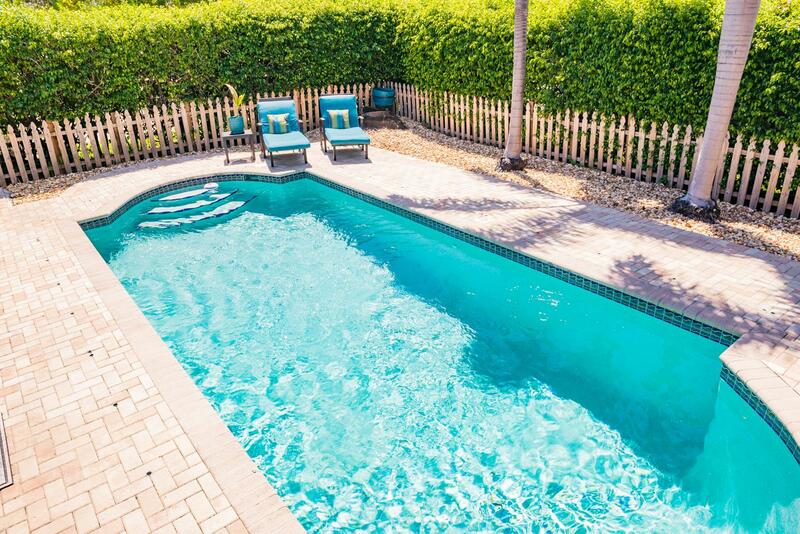 It is a verification of funds and your bank will hold available credit back from use. The authorized credit card hold will be processed on check-in day or prior to the renter's arrival. 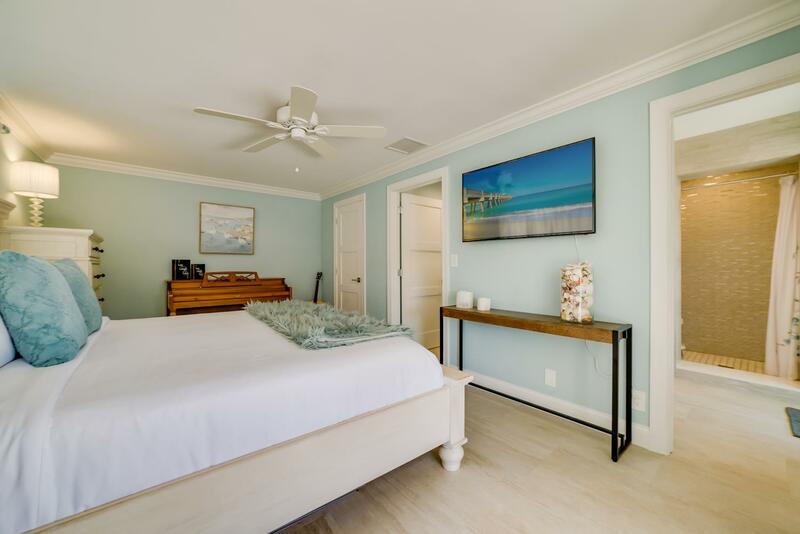 Your bank will hold the funds for a period of thirty (30) days and will automatically release them back into your available credit if we do not place a claim. In the event there are incidental utility charges or damage to the property we reserve the right to claim the Security Deposit. 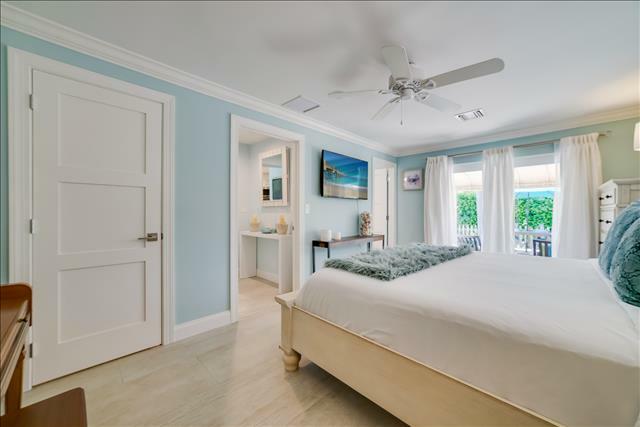 We will not include this amount in the total rental charges since it is initially just a hold and not an actual charge. 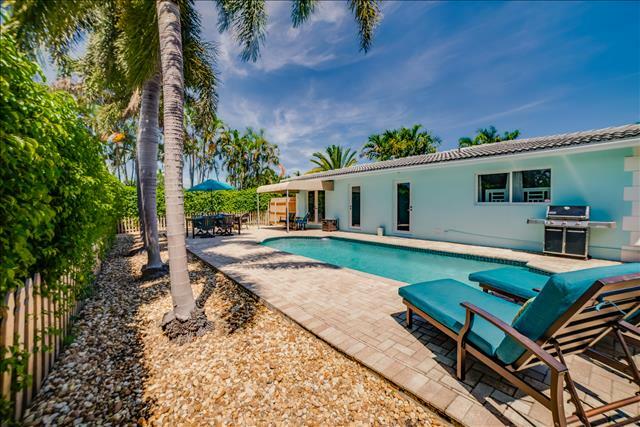 Casa Cordes is located within, approximately, fifteen (15) minutes from Fort Lauderdale / Hollywood International Airport, within, approximately, forty-five (45) minutes from Miami International airport and within, approximately, forty-five (45) minutes from Palm Beach International Airport. 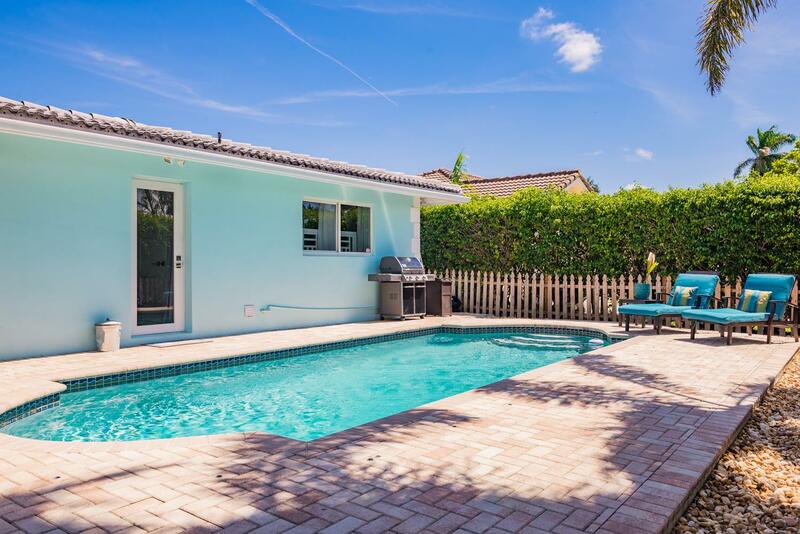 Casa Cordes is located within, approximately, fifteen (15) minutes from downtown Fort Lauderdale, within, approximately, fifteen (15) minutes from downtown Boca Raton and within, approximately, forty (40) minutes from South Beach. 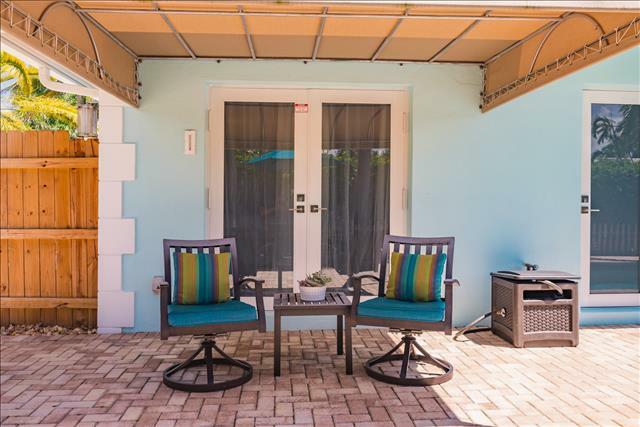 There is a brand new Publix located within 1/2 mile from Casa Cordes. There is also a Whole Foods Market within, approximately, five (5) miles from Casa Cordes.